In addition to supplying products and materials, we provide solutions with service from our "partner" affiliations. We offer turn-key solutions. LED Lighting - Free consultations. Learn more. Contact us for quote on products and installation. Do these areas interest you? 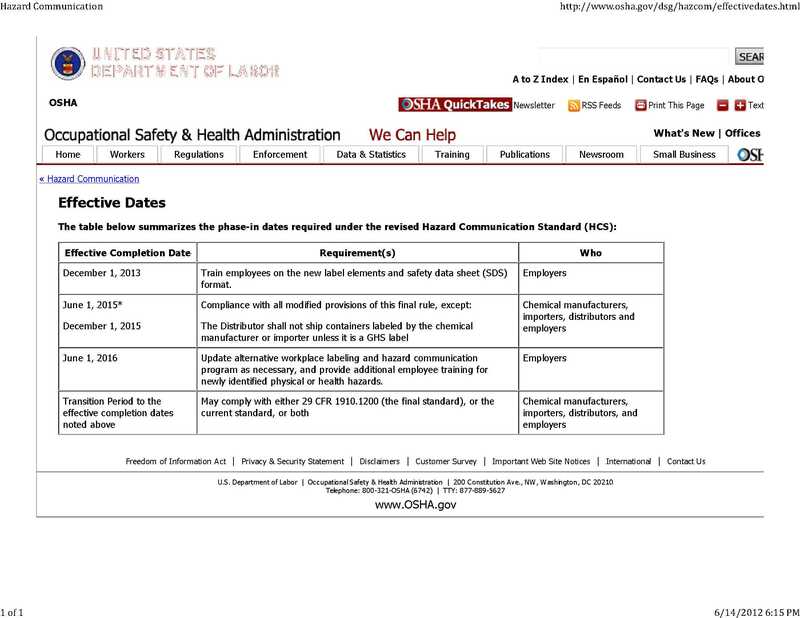 OSHA Haz Com 2012 & GHS is HERE. Are you ready? We can help. Federal Register: The Final Rule was filed on March 20th at the Office of the Federal Register and is available for viewing on their Public Electronic Inspection Desk. The Federal Register published th final rule on March 26, 2012. ﻿Effective Dates - Click on image to zoom in or to view doc. Click here for more OSHA & GHS Compliance information. Did you know that an (M)SDS is to remain on file with employer for a minimum of 30 years? (OSHA CFR 1910.1020) Employers, we know that you respect the right of your employees "to know" and now with GHS implementation "to understand". Doing this manually is a full time job. Let us save you time and money and vulnerability to fines with an electronic software management system for your hazrdous chemicals. We can bring you several choices to consider. We do have a favorite! Our favorite due to their expertise, experience, and value is KHA's Online-SDS. Let us set up a web demo for you. We have some particulars to share with you after shopping the marketplace as to why we prefer KHA as our primary provider. Click here to contact Mary, or go to their website directly. In addition to being an authorized seller at HCS Inc, Mary Scaggs is also now a Sales Manager at KHA Online-SDS. By appointment, Mary will give you a personal, guided online tour of the KHA system to demonstrate your workflow solution options with this award winning system. You are in good hands with KHA. KHA innovated the entire industry of (M)SDS computerized services. As a manufacturer of hazardous chemicals, or a distributor, it is your responsibility to provide the MSDS and soon to be required new GHS format for new and existing products. We have chosen to partner with a leader in the industry, KMK Regulatory Services. Click here for an overview of their services. Let us set up a tele-conference with them for you to learn more. Contact Mary Scaggs. View their website directly. Ask for Daniel Lavoie, EVP of Regulations. Tell him that Mary Scaggs referred you. OSHA recommends that you start planning now for this transition to GHS. We can help. Contact us. New Products OH&S award winning tools. Does your project call for more than just materials? Our network of trade professionals may provide just the solution you are seeking. Our network of trade professionals include roofing, plumbing, HVAC, electrical contractors, customer fabricators, engineers, exhibit managers, glass tinting for energy savings, safety, beauty, LED lighting - new and retrofit - design and manufacturing - interior and exterior - commercial and industrial - to name a few. Let's discuss your interests. What is Haz Com 2012? We'll confirm your understanding. For more general information on OSHA Haz Com 2012 & GHS compliant solutions click here. - We are approaching 4 trillion documents being stored by businesses and government agencies. - Each four-drawer file cabinet holds an average of 10,000 to 12,000 documents, takes up to 9 square feet of floor space, and costs $1,500 per year. - Every 12 filing cabinets require an additional employee to maintain. - Paper in the average business grows by 22% a year, meaning your paper will double in 3.3 years. ﻿Contact us to discuss solutions. Make this the year you set yourself up for winning the battle over the printed word.